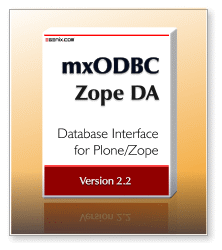 eGenix is pleased to announce mxODBC Zope DA™ version 2.2.2, our popular Plone/Zope ODBC Database Adapter, compatible with Plone 4.0 - 4.3 and Plone 5.0, Zope 2.12 and 2.13 and Python 2.6 and 2.7 - available on all major platforms. The eGenix mxODBC Zope DA™ allows you to easily connect your Plone CMS or Zope installation to just about any database backend on the market today, giving you the reliability of the commercially supported eGenix product mxODBC and the flexibility of the ODBC standard as middle-tier architecture. The mxODBC Zope Database Adapter is highly portable, just like Zope itself and provides a high performance interface to all your ODBC data sources, using a single well-supported interface on Windows, Linux, Mac OS X, FreeBSD and other platforms. This makes it ideal for deployment in ZEO Clusters and Zope hosting environments where stability and high performance are a top priority, establishing an excellent basis and scalable solution for your Plone CMS. Reenabled returning cursor.rowcount for FreeTDS >= 0.91. In previous versions, FreeTDS could return wrong data for .rowcount when using SELECTs. Removed exists() built-in from mxODBC Zope DA's implicit addition of new built-ins via mxTools. This resolves a hard to track bug where the new built-in could potentially override the TAL python:exists function (in e.g. tal:condition="exists:something"). See this Products.CMFEditions fix for an example where the problem surfaced. This is a bug in TAL (it shouldn't give preference to built-ins over its own helpers), but we're providing the fix as easy work-around. mxODBC Zope DA 2.2.0 was released on 2014-12-11. Please see the mxODBC Zope DA 2.2.0 release announcement for all the new features we have added. The complete list of changes is available on the mxODBC Zope DA changelog page. Users are encouraged to upgrade to this latest mxODBC Plone/Zope Database Adapter release to benefit from the new features and updated ODBC driver support. We have taken special care not to introduce backwards incompatible changes, making the upgrade experience as smooth as possible. Customers who have purchased mxODBC Plone/Zope DA 2.2 licenses can continue to use their licenses with this patch level release. For major and minor upgrade purchases, we will give out 20% discount coupons going from mxODBC Zope DA 1.x to 2.2 and 50% coupons for upgrades from mxODBC Zope DA 2.x to 2.2. After upgrade, use of the original license from which you upgraded is no longer permitted. Patch level upgrades (e.g. 2.2.0 to 2.2.2) are always free of charge. Please contact the eGenix.com Sales Team with your existing license serials for details for an upgrade discount coupon. If you want to try the new release before purchase, you can request 30-day evaluation licenses by visiting our web-site or writing to sales@egenix.com, stating your name (or the name of the company) and the number of eval licenses that you need. Please visit the eGenix mxODBC Zope DA product page for downloads, instructions on installation and documentation of the packages. If you want to try the package, please jump straight to the download instructions. Fully functional evaluation licenses for the mxODBC Zope DA are available free of charge. Commercial support for this product is available directly from eGenix.com. Please see the support section of our website for details. For more information on eGenix mxODBC Zope DA, licensing and download instructions, please write to sales@egenix.com.